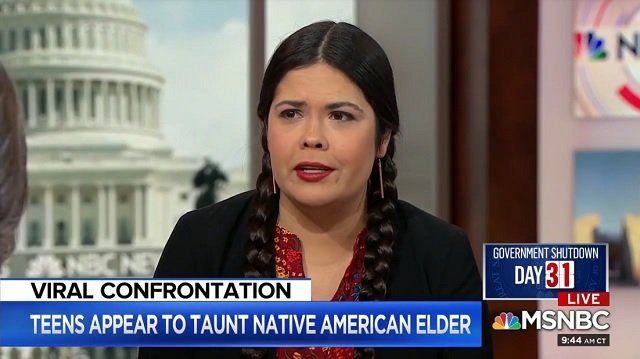 Monday on MSNBC, Indigenous People's March organizer and tribal rights lawyer Tara Houska repeated the debunked lies that Covington Catholic students "surrounded" Native American Nathan Phillips and chanted "build the wall" at him. Tribal Rights Lawyer accuses Covington Catholic Kids of surrounding Nathan Phillips (evidence shows Mr. Phillips walked up to the kids) and chanting “build the Wall” (she provides zero evidence of this). [...]Houska said she rejected high school junior Nick Sandmann claim's he was trying to defuse the situation and said he was "clearly mocking" Phillips. The image of Sandmann smiling as Phillips beat his drums inches from his face went viral along with the video itself. Phillips said he felt threatened and blocked from moving, while Sandmann said he was trying to calm things down. At no point did Jackson correct her, even though she was literally sitting there with Nick Sandmann's statement. Does anyone believe Jackson hasn't seen by now the extended videos showing Phillips approached the students and got in their faces -- banging his drum within inches of Sandmann's head while chanting at him? There is zero evidence the students chanted "build the wall" at Phillips in any of the videos produced and they all firmly deny doing so, but Houska -- who is a lawyer -- insists it happened even though she admits she wasn't even there.